Spring is here!! With the season comes in more complaints of knee pain. Visiting a chiropractor can be one of the best solutions to improving your pain when you understand the anatomy. Many muscles cross the knee joint and if they aren’t in proper alignment, the result can create discomfort and swelling. Many of these same muscles also attach to various areas of the pelvis, which is why an adjustment to both the knee and pelvis can help pain quickly. 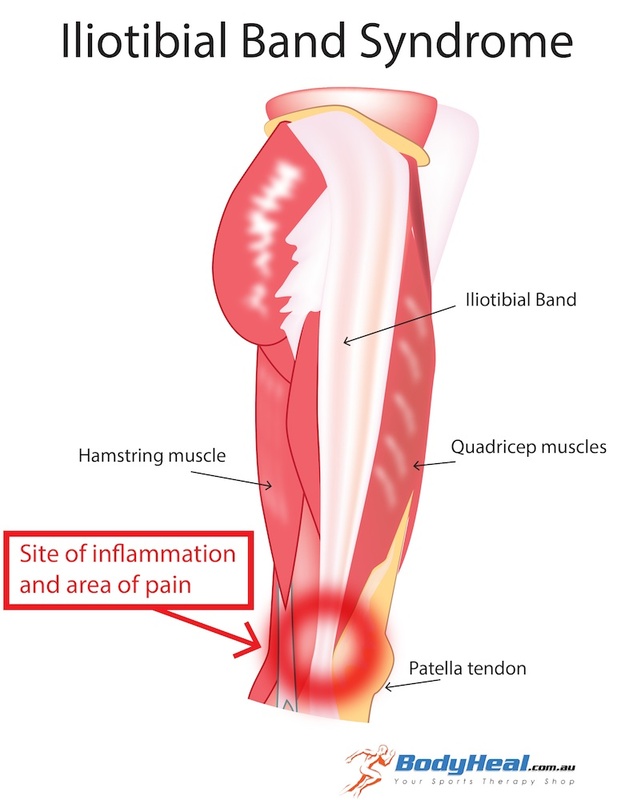 One major source of knee pain is on the outer or lateral side of the knee. 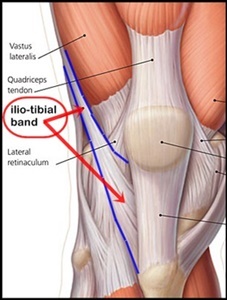 This often times is a result of a tight IT (iliotibial) band. This is fairly common in women as hips are wider than men’s creating a larger Q angle putting more stress on this muscle. When a muscle gets “tight” or contracted, pain will typically be felt on one of the ends or you may experience a tender spot or trigger point in the middle of the muscle belly. You can roll this muscle out all day long and it won’t change if the bones that the muscle is attached to are out of alignment causing the muscle to be stretched. That’s why it is imperative to see a chiropractor to address the underlying cause of the contracted muscle resulting in the knee pain. The reason is causes knee pain is because the band cross the knee joint thus creating stress on the joint itself. When looking at this picture to the right, you may notice that the quadriceps (quad for short) also crosses the knee joint. We tend to see pain in the kneecap also known as the patella and at the top of the shin where the quadriceps muscle attaches to the bone. This is another common muscle to be in a contracted state particularly now that it’s running season. Whenever you have any type of pain, the moral of the story is to contact your chiropractor to see what is happening to the alignment of your bones and what muscles are affected. An adjustment can get you back into running, competition or just feeling your best so quickly that it never ceases to amaze us how well the body heals. Just last week, we had two patients in the same day with pain related to their quads and the other to their IT band. They both noticed relief and improvement in their pain immediately following an adjustment. No therapy was performed but rather just a simple, old-fashioned adjustment. If you’re in the southwest metro including: Chanhassen, Chaska, Eden Prairie, Waconia and surrounding cities, please contact us at 952-474-1949 so that we can help get you out of pain quickly to live your optimal life.